Charles Forgrave lives in Sault Ste. Marie, Michigan. He was raised in the Iroquois Beach, a nearby fishing and lumbering village. He and his wife, Linda, are raising two beautiful children, Trey and Tishella. He enjoys hunting, fishing and spending time at the beach with his family. Love Buries a Spring Bird by Charles Forgrave is a beautiful love story with a lot of entertainment for readers. Set in a colorful and remote village in Michigan, readers encounter two compelling young characters, Cortney and Jackie, whose attraction to each other has no bounds. The reader is swept up in an emotional fire of love that carries the two along until, moving to Saulte Ste Marie, they are compelled to face reality and challenges that wake them up and force them to reexamine the depth of their love. Do they have the strength to go beyond innocence and the trials that threaten to break them apart and rediscover what is most essential in the art of love? Charles Forgrave’s narrative is exceptional, done in a first person narrative voice that is warm and charming. From the start of the novel, the reader is seduced by the author’s smooth and polished writing, the ability to integrate details into the narrative without distracting the reader, and the skill of unveiling emotions and thoughts that are almost hidden in characters. I fell in love with the dialogues, which are at the same time witty and plot-driven, focused and natural. The scenes are beautifully written and there is no confusion when it comes to points of view. The pacing is perfect for this kind of novel, but what had me utterly engrossed was the author’s treatment of character. Jackie and Cortney are well-explored and the supporting characters come out beautifully in the narrative as well. Love Buries a Spring Bird features the writing and the storytelling craft peculiar to the masters in the genre. Love Buries a Spring Bird by Charles Forgrave is a beautiful story of two people who fall passionately in love and try to fight the world and everything against them as best as they can. Before I jump into the actual review, let me just tell you that this novel is breathtaking and simply too beautiful to describe in words. The intensity of emotions and passion was at times too much, yet I could not stop reading because I did not want to stop myself. This is the story of Jackie and Cortney; they were a little too young when they met and fell in love, but it was love after all. Swept away by their passion and love for each other, the two quickly found out that their love was enough to sustain them. However, soon they realized that real life is just too harsh for young lovers like them. Challenges brought on by their youth and the people around them force them to take notice of what they have and what could have been. What will happen to Jackie and Cortney? Can their love sustain the test of time? Or will their love perish? Love Buries a Spring Bird is simple yet complex at the same time. The connection between Cortney and Jackie is intense, passionate and full of raw emotions. Charles Forgrave did an amazing job at creating and developing real characters that we can relate to and enjoy. The writing style can be described as charming and real, almost like the writer is talking to the reader and pulling us into the story along with the characters. There is nothing that I can find to fault in this book. It is simply too perfect to end! I enjoyed it so much. Love Buries a Spring Bird by Charles Forgrave got me intrigued by its title, and I am glad I picked it up because I found it to be a delightful read. It’s a book for readers who enjoy love stories that are character-driven, rooted in the context of real human experience and imbued with lessons of the heart. This might not be the kind of thing you’d read in Nicholas Sparks’ novels, but it stands out in its originality and in the way it explores the paths of the heart. It’s a tale of love between two people, Cortney and Jackie, who get swept off their feet so quickly that they forget many realities of life. But time and challenges on the way force them to mature quickly as they learn the hard truth that love can be more than just what one heart feels for another, and how far can they go to protect their love? This book is so human, so rooted in reality that readers will feel like the author is telling their own story. It’s hard to not find oneself in one of the characters. While Charles Forgrave’s characters are very genuine and relatable, the writing leaps off the pages with unusual charm and I enjoyed the author’s unique gift for great conversations and vivid descriptions. Character curve is well handled and readers will be able to measure it against the development in the conflict. Love Buries a Spring Bird plunges the reader not only into a great and beautiful setting with interesting characters, but right into the complexities of the hearts of the characters. I couldn’t put the book down until I read the last page. 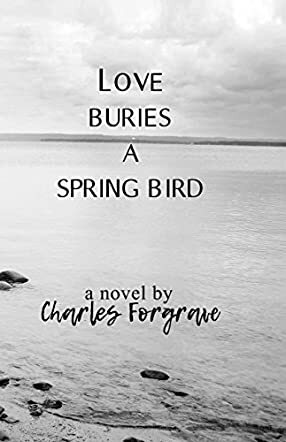 Love Buries a Spring Bird by Charles Forgrave is a poignant love story between Cortney and Jackie who meet at Iroquois Beach, a fishing village. Jackie is attractive and has the right curves in the right places. Cortney likes Jackie and he realizes that she is everything that he wants in a girl. As the story progresses, readers get to see how the relationship between Cortney and Jackie develops and how they fall deeply in love with each other. The scene then moves to Sault Ste. Marie where the realities of life get in the way of their love for each other. Will it affect their relationship or will Cortney and Jackie still be together? The story is heartbreaking and sad. All the characters are well portrayed and they complement the characters of Cortney and Jackie beautifully. The love between Cortney and Jackie is gentle yet passionate, the deep emotions and feelings that run inside them are tangible to readers. There is an element of innocence and naivety that threads through this love story. Narration is detailed, making the scenes vivid, and the author brings out a kind of love that is beautiful; the feelings Cortney and Jackie have for each other feel like a dream. It is heart breaking to see Jackie’s world falling apart and how the relationship between Cortney and Jackie disintegrates slowly. The emotions in the story run deep, they are palpable, and the feelings of angst and grief make the characters and their circumstances real and relatable to readers.